Land Remediation Relief is a relief from corporation tax only. It provides a deduction of 100%, plus an additional deduction of 50%, for qualifying expenditure incurred by companies in cleaning up land acquired from a third party in a contaminated state. The tax releif is available on both commercial and residential developments. Qualifying Land Remediation Expenditure can be claimed for tackling pollution, natural issues, such as radon, arsenic or Japanese Knotweed or remediating long term derelict land. 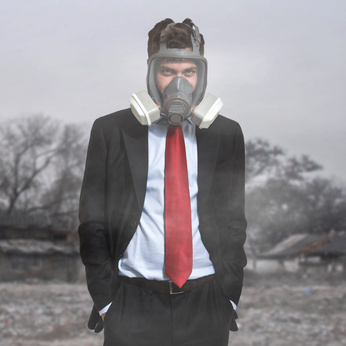 Asbestos is a common issue and qualifies for Land Remediation Relief…. Legislation in The Control of Asbestos Regulations 2006 and The Control of Asbestos Regulations (Northern Ireland) 2007 governs the way that asbestos is removed. As a result additional costs may be incurred in containing the asbestos and dust during removal. For example, a licensed contractor must be employed to remove high risk material, such as pipe insulation or asbestos insulating panels. The additional costs incurred in order to comply with the regulations are part of the cost of removing the asbestos and so may qualify for Land Remediation Relief. HM Revenue and Customs (HMRC) is sending out 5.8 million tax credits renewals packs which will arrive by 30 June. 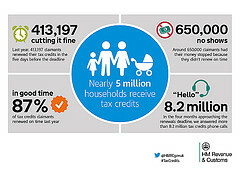 Over 3 million of these claims need to be renewed before the deadline for claimants to continue receiving tax credits. Last year some 650,000 claimants had their money stopped because they did not renew by the 31 July deadline. Claimants must tell HMRC about any changes to their circumstances that they haven’t already reported, including changes to working hours, childcare costs and income, or if a partner has moved in.